KOLKATA, India July 22, 2011- Loss of Habitat, human interference over wildlife and decreasing numbers of wild cat in the jungle sometime still make a big appearance in public. 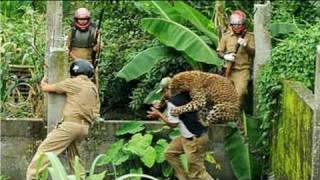 Forestry officials were forced to flee, dive for cover and even climb up on a jeep to escape the adult, male leopard’s attacks in West Bengal state. At one point, the big cat leap through the air, fangs bared, and tackled a man, clutching him in its giant paws as it knocked him off the wall he was standing on. It injured six villagers, a policeman and four forest guards before being hit with a tranquilizer gun Tuesday. The people are recovering from their injuries, mostly swipes from the cat’s claws. The cat died within hours after the showdown, and a postmortem is being conducted.